Saint Lawrence Church, Diocese of Linköping, Sweden. 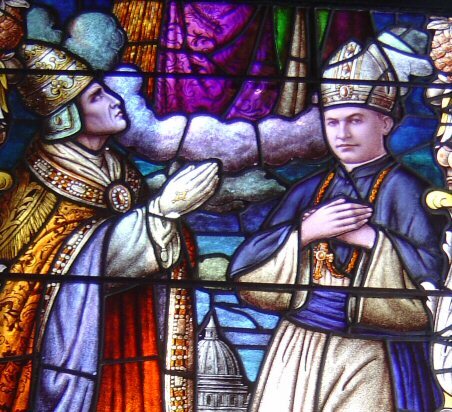 Pope Pius XI (left) blesses Bishop Stephen Alencastre as fifth Apostolic Vicar of the Hawaiian Islands in a Cathedral of Our Lady of Peace window. In Roman Catholicism, the pope as the bishop of the Diocese of Rome, creates the other Catholic dioceses throughout the world and chooses their bishops. Diocese Facts for Kids. Kiddle Encyclopedia.